The age of the universe is approximately 13.77 billion years. This age is considered by measuring the distances and radial velocities of other galaxies, most of which are flying away from our own at speeds proportional to their distances. Using the present expansion rate of the universe, we can imagine “rewinding” the universe to the point where everything was contained in a singularity, and calculate how much time ought to have passed between that moment (the Big Bang) and the present. 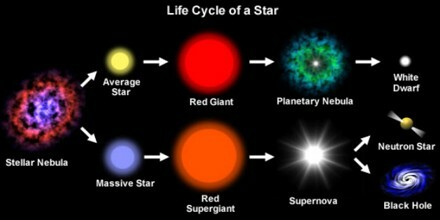 The life cycle of a star is based on its mass. More massive stars burn faster than their lower-mass siblings. A star 10 times as massive as the sun will burn through its fuel supply in 20 million years, while a star with half the sun’s mass will last more than 20 billion years. The mass also affects the brightness, or luminosity, of a star; more enormous stars are brighter. Dense collections of stars known as globular clusters have similar characteristics. The oldest known globular clusters have stars with ages between 11 and 18 billion years old. The wide range comes from problems in pinpointing the distances to the clusters, which affects estimates of brightness and thus mass. If the cluster is farther away than scientists have measured, the stars would be brighter, thus more massive, thus younger than calculated. The uncertainty still creates a limit to the age of the universe; it must be at least 11 billion years old. It can be older, but not younger. 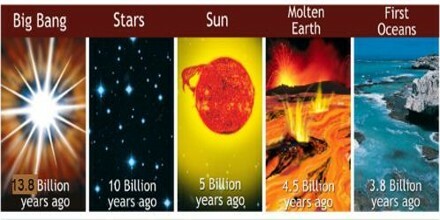 We know from studies of radioactivity of the Earth and Sun that our solar system probably formed about 4.5 billions years ago, which means that the Universe must be at least twice that old, because before our solar system formed, our Milky Way galaxy had to form, and that probably took several billions years by itself. 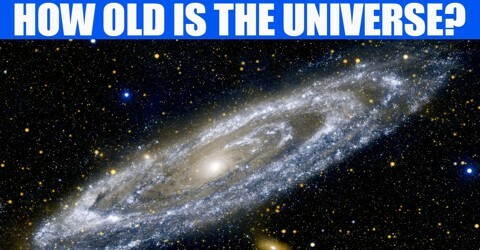 It would be reasonable to guess that the Universe is at least twice as old as our Sun and Earth. However, we can’t do radioactive dating on distant stars and galaxies. The best we can do is balance a lot of different measurements of the brightness and distance of stars and the red shifting of their light to come up with some ballpark figure. The oldest star clusters whose age we can estimate are about 12 to 15 billions years old. So it seems safe to estimate that the age of the Universe is at least 15 billion years old, but probably not more than 20 billion years old. This matter is far from being settled by astrophysicists and cosmologists, so stay tuned. There could be radical new developments in the future. What about the ages of stars and galaxies, and the age of the whole universe? One way to measure these ages is with the travel time of light. Light travels incredibly fast – 300,000 kilometers per second, or 186,000 miles per second. On Earth, the delay due to light travel time is a tiny fraction of a second. But in space, the distances are so vast that the light takes a substantial amount of time to travel to us: 8.3 minutes from the Sun, 4.3 years from the nearest star, and about 8500 years from the center of the Milky Way galaxy. That delay means that we don’t see these objects as they are right now, but as they were when the light left. The universe actually works as a sort of “time machine,” in which we can see into the past simply by looking far away. Not only can astronomers measure the distance of galaxies, they can measure how galaxies are moving. Galaxies are not holding still in space, nor are they moving randomly. Some galaxies are moving towards their neighbors, attracted by their mutual gravity. But the biggest pattern we see is that galaxies are moving apart from one another. This motion apart is not all at the same speed; instead it follows a pattern where galaxies that are further apart are moving more quickly. Many different and complementary scientific measurements have established with near certainty that the universe and the Earth are billions of years old. Layers in glaciers show a history much longer than 10,000 years, and radiometric dating places the formation of the Earth at 4.5 billion years. Light from galaxies is reaching us billions of years after it left, and the expansion rate of the universe dates its age to 13.7 billion years. These are just a sampling of the types of evidence for the great age of the Earth and the universe; see the resources below for more.